We reviewed Toshiba’s Tegra 2-based Thrive 10.1” late last year and from a design standpoint, we were pretty disappointed with it. 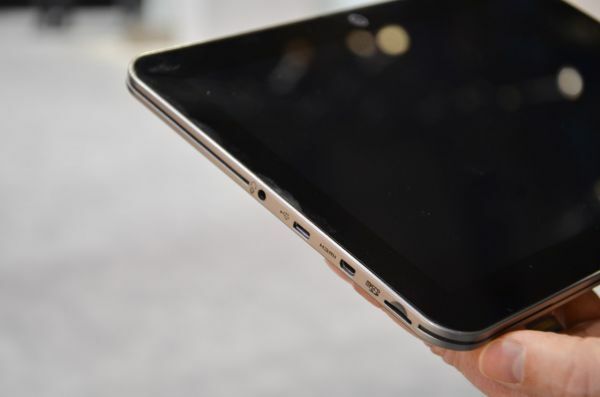 While elements like the removable battery, full size ports, and rubberized back cover were well done, overall the Thrive just wasn't designed as well as the leading Android tablets. It hit a more value oriented price point than higher end products like the Samsung Galaxy Tab 10.1, but even compared to more midrange tablets like the Asus Transformer, the Thrive just wasn't competitive. Toshiba learned a lot from their experience with the Thrive, and clearly desire to improve on their tablet designs in the future. To that end comes the new Excite 10”, a tablet that represents a dramatic step forward from the Thrive, significantly improved in almost every way. Gone are the curved edges, rubber backing, and chunky design. In its place, we find an extremely slick looking tablet that can easily compete with the cutting edge of that Android world. 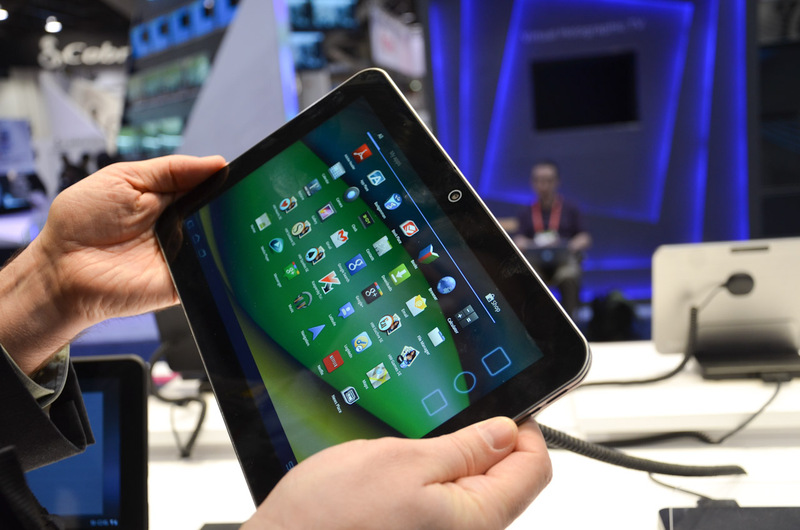 At 7.7mm thick, it's definitely one of the thinnest new tablets on the market. The back is flat and made of magnesium alloy, with a rounded rim around the edge of the device. 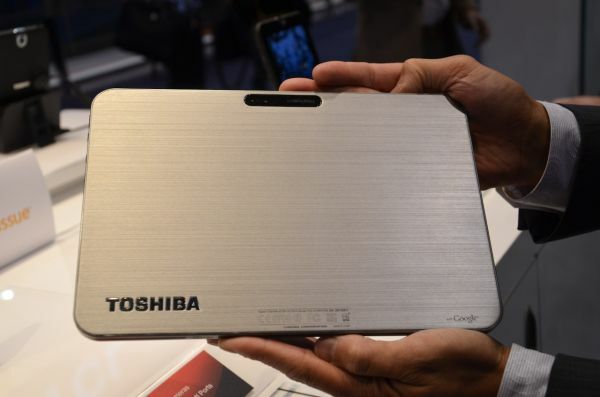 Toshiba went with magnesium alloy instead of a cheaper aluminum extrude here because magnesium was lighter and more structurally rigid than a brushed aluminum casing would have been. Spec-wise, the Excite has a 10.1" 1280x800 display with an IPS panel and Gorilla Glass covering the screen (fixing our only two complaints with the Thrive's otherwise excellent display panel). It's running TI's OMAP 4430 inside clocked at 1GHz. The higher clocked OMAP 4460 (1.5GHz) didn't fit in the thermal envelope Toshiba was shooting for with the Excite, there just wasn't enough heat being dissipated to handle the increased clock speeds. The Excite does lose the full-size ports of the Thrive, though that makes sense given that a standard size HDMI connecter is actually thicker on its own than the entire chassis of the Excite (!). The units we went hands on with had Ice Cream Sandwich installed on them, the final device may ship on either Honeycomb 3.2 or ICS depending on when the Excite hits retail as well as how long it takes Toshiba to finalize the ICS port for the Excite. I must say, I'm absolutely in love with the industrial design of the Excite. It also feels great in hand, a completely opposite experience from the original Thrive. It's a very premium feeling device, and it has a surprisingly solid frame even with the utter lack of thickness. I'm really impressed to see how far Toshiba has come in terms of design and quality since the Thrive was shown off here last year. Toshiba envisions the Excite as a premium level product slotting above the Thrive, so the Thrive will still be sold alongside the Excite. MSRP is $529 for the 16GB and $599 for the 32GB, price points that I think are on the optimistic side given that a similarly premium design-oriented product launched recently with the Tegra 3 quad-core SoC for $499/599 for 16GB/32GB. Availability is expected close to the end of Q1, and we'll definitely have an evaluation unit to look at when it does hit market. 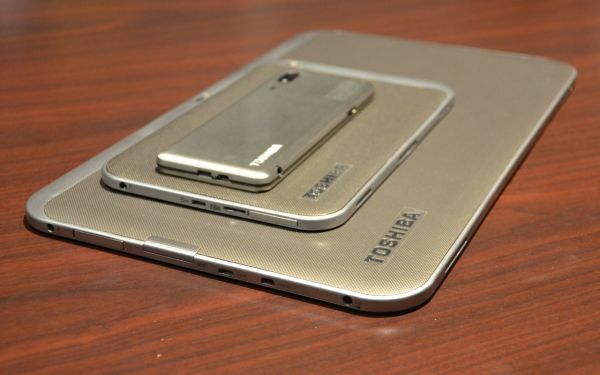 Toshiba also showed off a few tablet design concepts, with 5.1", 7.7", and 13.3" form factors being shown off. The industrial design used across the entire lineup is more mainstream-oriented than the high-end Excite, though in this case that still means a relatively thin body, clean lines, and a textured plastic backing. Overall they feel pretty good, and are a significant step forward from the rather clunky Thrive design. The 7.7" model with an OLED screen especially was impressive in both in form factor as well as feel and industrial design. The 13.3" model was an interesting one in that we haven't seen a whole lot of larger tablet form factors at CES this year. I personally feel like it's something that really lends itself to being a Windows 8 tablet, but Toshiba officially says that they are still evaluating both hardware and software choices for all of the future tablet designs. It's worth noting that all of the design concepts were running Android, and it's a distinct possibility that both Win8 and Android models will exist. Toshiba genuinely seems to be agnostic on a hardware platform level (as shown by their use of Tegra 2 in the Thrives and OMAP 4 in the Excite) so it's not difficult to believe that they don't have a silicon partner finalized yet for any of the concept tablets. These prototypes were hand built preproduction units, so build quality was obviously not something we could evaluate, but even so, I came out with high hopes for Toshiba's tablet future. Availability was expected to be Q3 onwards, with the 5.1" model with a 21:9 aspect ratio screen being made primarily for the Japanese market and probably not having high hopes for a US launch. Actually, amazingly enough the tablets should start seeing 1920x1200 in Q2 this year. I asked several manufacturers, "How is it we're getting 16:10 aspect ratio tablets with IPS WUXGA displays, and you still can't put anything better than a low quality 1366x768 TN panel into your laptops?" Naturally, they all blamed the display manufacturers and consumers for not being willing to buy better quality laptops. There's certainly some truth to that, but it's a matter of supply and demand; if ASUS for instance were to order a million 13.1" 1920x1200 IPS laptop displays, I'm sure they could get prices down to tablet levels. They're just worried that the laptops wouldn't sell well enough, and with all the $500 Best Buy laptops floating around they're probably right. Long term, I think the higher quality displays in tablets and HDTVs are eventually going to force laptops to get better displays. What's sad is that I have a 1920x1200 laptop from five years ago, and that display probably cost Dell $350. Today's $350 displays are almost universally worse, other than having brighter LED backlighting. Meanwhile, the $1000 Core 2 Extreme CPU in the laptop is now slower than even a basic $130 Core i3-2310M in most tasks, and this formerly $4000 laptop is also slower than today's laptops that cost just $750. Jarred, I'm glad you typed that. This pretty much sums up everything that is wrong with laptops and displays right now. Almost every person I know who's bought a new notebook has mentioned the screen quality being substantially worse then what they're upgrading from. How many more steps back is the LCD industry going to take? How many cost cutting maneuvers is too much? Every LCD specification standard is a lie made to hide their crap panels from unsuspecting customers. Hello !!! First of all, Merry Christmas and a Happy New Year! I hope that this tablet is very light and also looks feels like quailty too.